Here’s a great one to entertain kids and adults alike at holiday gatherings or whenever you need quiet time, during school time or otherwise. 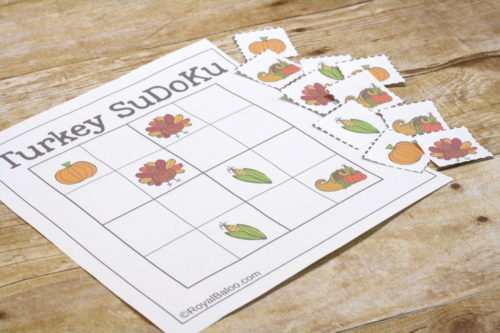 Royal Baloo has made a cute printable Thanksgiving sudoku game that’s almost no prep and endless fun. Have you ever played? It’s a logic game usually using numbers, where you place the numbers on a grid and the same number can’t be found in the same row or column on the board. In this case, she uses fun fall pictures like corn, pumpkins and turkeys. The game board starts with a few icons in place; to play, just figure out where the rest of them go. Two versions are included in the free, printable PDF download. I imagine you could even use a blank board and set it up with a few of the pieces to start and see if you can solve different puzzles, too. How fun!